This recipe is for real mushroom lovers. Some people are funny about mushrooms. I have a good friend that calls them the anti christ, and another friend who claims she hates them but never turns down a bowl of my mushroom soup. My fiance's yes I said fiance my infamous bf is now my fiance - he poped the question Friday night and I'm engaged. WOOHOO. Well my father in law to be is a vegetarian who also despises these fungal forrest finds. I just love love love them. Mushrooms are incredibly healthy, are super versatile and they have rich earthy flavors. This salad is originally a Giada de Laurentiis recipe. The mushrooms are served raw, let them sit in the vinaigrette for an hour before garnishing and serving. PREP: to clean mushrooms wet a cloth and rub the dirt off the mushroooms gently trim or pull off the stem and discard. Add mushrooms and parsley in a bowl with dressing. The mushrooms should absorb some of the liquid before serving. PREP: chop beets and rutabaga into bite size piece, roughly chop parsley but keep it separate. COOK: roast beets and rutabaga on separate pans or baking trays - you do not want the beets to bleed their colour on the yellow rutabaga. 350 degrees for about 45 minutes. Let cool for a few minutes before serving. The good part about these root veggies is that they taste great room temp as well. SERVE: toss everything together with lots of fresh ground pepper and corse salt sprinkled on top. Nobody likes doing it! I hate the word diet! I don't believe in any gimmicks to loose the fat fight, but some times we all need a little help to choose what to eat. Epicurious.com has laid it all out for us. What to eat if you like/dislike/can't live without it/would rather die then eat it-guide to dieting. I've decided to make this post the kick off for the annual spring fat off. The fat off if a contest started by my friend Billy a true Tomato Snob who every year bets one of our friends BK (not Burger King although he has the gut of someone who really looks like they love the drive though line) which one of them can loose more wight in three months. Now let me get the record straight. I do not condone any type of contest where you are trying to loose weight fast and furiously just to win the the title, or to gain bragging rights, and rub it in the face of your fatter competitor. Loosing weight is a process, and I think people should look at it as a life change then something to do between Thanksgiving and New years. Having said this I'm in despirate need to shed some pounds and am going to blog my way through what I hope to be a life changing experience. I'm four weeks in and already I feel better, and have more energy. The plan is to continue eating well, meaning whole foods fresh, seasonal and balanced eating and working out 4-5 times a week. This is not hard, although it does involve a certain level of commitment, and will power. I will also allow myself one cheat day a week, but I will try to make my own junk food instead of resorting to what most people do and hit up a drive through or open a package of. I really want to limit the number of times I eat out at restaurants, or get delivered food, which will also hopefully make me a better cook! So I leave you all today with a challenge, I dare you to join me. Even if you don't have a lot of weight to loose but if you have bad eating habits. Look at your own lifestyle eating habits, drinking habits and decide if it could use a bit of a spring cleaning as well - your colon will thank you later in life I promise! PREP: chop onion, garlic and parsley. COOK: sautee onion and garlic until golden, add oregano & red pepper flakes then tomatoes and splash of wine - red or white whatever you have as well as shredded carrot. Adjust seasoning (S & P). Simmer for 7 minutes. Take off heat and puree in blender, put back into hot pan add chopped parsley, leave on heat until ready to use. french toast with multigrain Sha Sha Ezekiel bread and it was divine. COOK: warm some butter in heated pan. Fry the bread until golden. SERVE: with powdered sugar, or maple syrup and sections of blood orange. A great start to a great day! PREP: boil 1 cup Israeli cous cous in boiling water - cook like pasta and drain/ rinse after if needed. Set aside to cool. Place all ingredients - leaving out cous cous parsley and water in bowl to marinate. Heat up pan with splash of olive oil add mixture to hot pan and cover for 2-3 mins. Add splash of water and sort of sautee everything, until vinegar burns off and veg is slightly tender - you still want everything to have a bite 5-10 mins. Take off heat. Add chopped parsley cous cous and veg mixture in a clean bowl and serve. You can add an extra drizzle of olive oil and splash of lemon. So I bought this beautiful turkey breast from Bretta farms and I decided tonight would be the night I finally tried roasting a turkey. This was the easiest way to do it as the breast is a small section of this giant bird, and will only take 1 hour to an hour an a half. The turkey has already been de-boned but still had the skin on which will keep the turkey moist it will also be a perfect pocket for flavoring this delicious bird. Tonight I have decided to roast up some veggies including sweet potato, carrot and parsnip. PREP: finely chop herbs spices & garlic coat entire breast and under the skin. COOK: in roasting pan at 350 degrees for 1.5 hours. Add 1 cup dry white wine and 3 cups chicken stock in bottom of pan, and place in oven checking after 30 mins. If turkey begins to seem dry cover with tin foil. After 1.2 hours check with meat thermometer if cooked through, let sit for 10 mins before serving. You've heard me talk about them before but I just can't get enough of these wonderful tuberosus delights. The Jerusalem artichoke has absolutely no significance to its name sake Jerusalem - in fact I don't even think they grown in Israel at all. Jerusalem artichokes or sunchokes are void of any resemblance to artichokes all together not in taste texture or appearance. They taste more like a water chestnut or jicama. Weirdly enough Jerusalem artichokes are potato like dirt dwellers that are closely related to the sunflower family. They grow naturally from the Eastern seaboard from Georgia to Nova Scotia. FACT: In the 1600's the Jerusalem artichokes were accepted into French culture solely based on the fact that they bore the name artichoke. However they quickly fell into obscurity when potatoes became more widely accepted - they had previously been rejected because they were considered suspicious. One thing is for sure, these things are just fabulous! Roasted pureed or raw they always add something to the dish, just know they take a bit longer to cook then other root vegetables *if cooking on stove top cook at low temp to reduce browning, they are best roasted. This recipe is my homage to the Jerusalem artichoke. COOK: Sautee (sweat) onion, garlic and celery in butter and olive oil, add chokes and cook for 5 mins. Add the lemon juice, stock, wine, nutmeg and thyme and bring to a boil - cook until chokes are tender. Remove thyme sprigs and puree everything until smooth. Transfer mixture back to the pot, and cook on medium heat, add milk and zest and enjoy. Sometimes you just want a burger and fries! PREP: cut potatoes in to desired slices. Splash of oil s&p. Add 1/2 tbs spice mix, and form burgers, let sit for a few hours in the refrigerator or over night. COOK: Potatoes - oven roast 350 for about 35 mins, or more. Salt when cooked. Grill on bbq or in a grill pan 5-10 mins - I like burgers medium. One of my favorite Kensington destinations it's a go-to organics haven for locovores and Tomato Snobs alike. The staff is super friendly and the selections are SA-WEET! They also carry some of my favorite products from DGM (Dufferin Grove Market) including Forbes Wild Foods an amazing local line of forgaged goods. Last sunny Friday was officially the first nice day in Toronto I celebrated by treating myself to a lovely walk in Kensington with this place in mind. I had seen it on some other Toronto food blog, and when I missed my weekly trip to the market I knew its would be the perfect day for a review. Shane was the lovely guy who helped me. I had some questions about black radishes and concerns about their soft spots. He taught me that if I put veggies that have gone a bit soft in a bowl with cold water it would firm back up... Interesting... He also said that if it the radish wasn't good I should come back and let him know, and he would give me a fresh one. Mega points!!! I love anywhere with good customer service, it's very important and these days very hard to find. Shane and I blabbed about jerusalem artichokes and how much we love eating them raw, and bla bla bla I could have chatted all day. Moral of the story is GO THERE! It's great, and not over priced. Last Friday I decided to make dinner for my boyfriends mom. His father/her husband was out of town and I thought it would be nice if we made dinner super easy for her. We showed up with a two course dinner, already made. Yes I scored major brownie points that evening. I made a roasted jerusalem artichoke soup, with lemon and thyme. Pink cous cous salad and red snapper in a lemon beurre blanc sauce. Just slightly fancy but my bf cringes every time he hears the word fish, so I have to make it sound like something a bit more appealing. Luckily this dish completely changed his mind about our scaley fillet friends. He tells me that his aversion to fish grew from many years of being forced to eat over cooked fish on a pretty much daily basis. His father is a vegetarian, and before the days of soy beef and tofurky the only other option was fish or peanut butter and jelly sandwiches, not exactly dinner. Over all the meal was a big hit, mother happy, left overs for father when he returns home from late day of traveling and my pescaphobic boyfriend is now a complete convert. I feel like foodie superhero, now if only I could change water into wine. Candy flowers - the best bouquet ever! A few weeks ago my boyfriend decided to get creative with a bowl of licorice. I was working away at my computer it was Saturday afternoon and he was working through a hangover from his birthday celebration the night before. I looked over to find him with a rolling pin sculpting me a bowl of beautiful licorice flowers. It was so cute! He described the flowers as water lilies, but I think they look a bit more like orchids, either way they were so pretty. I had to take a picture of them. There's nothing better then a surprise bouquet of flowers, especially when the flowers are made of candy. Tase this ________ I think it's gone bad. Has anyone ever been asked to taste something because someone else isn't sure if it's gone bad or not? Or do you know someone who keeps food sitting around for ages, because their not sure when to throw it out. Brought to us by The Foundation for Neo-cognitive & Ontologoical Research and Development I stumbleupon this useful table that basically gives you a guideline for when things go bad. I feel like I should blow it up, frame it and give it to my grandmother, who perpetually feeds us spoiled food and has absolutely no concept that food can go bad even in the freezer after a period of time. She seems to think the freezer magically transports the food back in time, and makes it edible for eternity. She's also the type of woman who moves with whatever she has in her fridge, pantry or freezer. Meaning that weather she is moving to Florida for the winter, or is back to Toronto for the spring, or moving from the condo she's been living in for 10 years she takes absolutely everything with her. I once heard her ask my mother to make a cous cous salad and freeze it so she could serve it at a dinner party a month later in Florida. Like they don't have cous cous in Florida? I'm still scratching my head over this one. My most recent horror came just a few months ago. My boyfriend and I were visiting her in Florida and she decided she wanted to make a Greek salad for lunch. I saw the feta cheese come out of the freezer, and the tomatoes come out of the fridge and I imediatly threw up in my mouth. I asked that she please leave the cheese and tomatoes off my salad, but she obviously refused and began yelling at me for being such a food snob. She loves to argue that I have no idea what I'm talking about when I tell her not to put the tomatoes in the fridge. As not to create any more issues I tell her just to make the salad the way she wants and throw everything in. Then she asks my bf and I if we like olives we both said sure! Little did we know that the best before date was 8 years earlier. Eewww. I sat down to eat my salad, and knew right away there was a whole bunch of things wrong in my bowl. I ate as fast as I could, and just pushed the olives off to the side - at this point I didn't know they had gone extinct. My boyfriend noticed that I had an entire bowl of olives left, and he began pilling them onto his plate. I couldn't believe my eyes, I knew sometimes he had weird taste in food, but I was really shocked that he couldn't taste anything wrong with them. I think he was just trying to get grandma to like him or something cause those things tasted like a dead rat. Not that I know what a dead rat taste like, but i'm guessing. When I finished eating I quickly started to clean up. I wanted to check the labels on the items I had just been fed simply out of curiosity. I knew they had been over due, but I couldn't have ever guessed how long overdue they actually were. The feta was at least 6 months old and the olives were just rediculous. They were older then my youngest cousin. I showed my bf the horror I had just seen, and I'll never forget the way he looked at me after that. I don't think he'll be as eager to eat anything she feeds him again. Anyways getting back to the point of this post. FOOD GOES BAD! Especially the food you should be eating. One of the "Food Rules" in Dr. Michael Pollan states that you should only eat foods that will eventually rot. And to my dear grandmother this doesn't mean you should eventually eat foods once they've gone rotten. All teasing aside, she's actually a very good cook, now if only I could teach her about properly caring for her ingredients. To all you hoarders out there, stop cutting the mold off your cheese, and your bread. Spend less on groceries, and go more often. Learn to eat what you buy, and learn when it's time to say goodbye to your pantry. 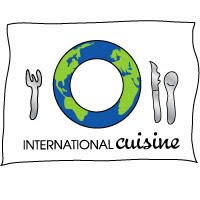 I stumbled upon this sweet webpage that has links to a bunch of different recipes for International cuisine. It's called the world health circle of international cooking, and boy is it useful. With almost 80 different types of cuisine you can cook from any walk of the globe anytime! So for your next cultural food experience check this site out for great recipe ideas. Let me know if anything is note worthy, and I promise to do just the same. or not it holds the #1 or 2 spot. He always argues that Sababa takes the cake, but I'm torn between Jerusalem, Mashu Mashu, and my all time favorite shewarma place Bagel Nash. I'll get around to reviewing all of these places individually later. Sababa is a legendary institution for many reasons the first being the food, and the second being that they have the best grocery and take out place connected to the restaurant. Great selection of Middle Eastern treats including baklava, Turkish delight and other imported products. They also have a bakery making pita fresh everyday. Definitely worth the trip up north. Last night were having a big dinner party in honor of my dads girlfriends birthday. There were nine of us, and we all love this type of food. To start, Sara (my dads gf) made the most delicious lentil soup, which she gave me the recipe for, and I will be writing about very soon. We gulped the soups back, and waisted no time getting to the main event pita and hummos, baba ganoush teheena also known as tahini & falafel. There was pleanty of tabbouleh and mixed salad, rice, fried tomatoes and eggplant, kefta, chicken and lamb kebab. I'm not a huge fan of their baba ganoush, but everything else is top notch. I love to drench my rice in the tomatoes - they are to die for. The best way to enjoy Middle Eastern food is to mash everything up into a pita. All the flavors taste great together, you just have to find the right balance and what type of meat suits you best. Their kefta kebab is my personal fave, although I wouldn't discriminate since everything is delicious. All in all as you can see we totally pigged out, but then again what are birthdays for. Believe it or not coriander seed is actually considered a fruit. These fruits have hollow stems and are known as umbelliferaes, they includes parsley, cumin, carrot, celery, fennel, parsnip dill, caraway, anise, Queen Annes lace as well as others. Coriander is also know as Chinese parsley, or in America cilantro - although to most North Americans this refers mostly to the leaf of the plant not the seed (fruit). Today we are strictly going to talk about the coriander seed, and leave the leaf talk for an herb post. There is a very distinct difference between the flavors of the seed versus the leaf, which we will get into later. Just to make it crystal clear when a recipe refers to coriander as a spice, it's asking you to use these citrusy little pods usually ground into a powder. Coriander is native to southern Europe, North Africa all the way to southwestern Asia. This means you can find it in a multiple of cuisines including Middle Eastern, Asian, Mediterranean, Indian, Mexican, Latin American, African, and even main stream American. The flavors or notes of this spice include lemon, nutty, warm, and bright. A great way to maximize the flavor of these beautiful seeds is to lightly toast them in a dry pan before grinding or crushing. It's best to buy them whole, and grind them as needed, as they will quickly loose their intensity if kept pre-ground. Coriander is used in many different ways, it's a great pickling agent, can be used instead of caraway in rye breads or even used to brew certain styles of wheat beer. There are also some medicinal properties to the fruit, in Iran they believe it to relieve anxiety and insomnia. It is also used in Indian medicine as a diuretic as well as a digestive aid. In learning about different spices it's amazing how many of them are praised in different cultures for their healing powers. If you've got a great recipe that uses coriander please let us know all about it. Coriander has most recently been used in my recipe for carrot salad. PREP: Cut all veg & fruit into slices drizzle with olive oil and roast in oven for 30 mins or so at 350. If you like to char them a bit longer thats fine they taste even more delicious that way. Let everything before assembling the salad. DRESSING: add 2 part olive oil to 1 part lemon juice, add dollop of honey s&p. TIP: you can roast the veggies a day or two in advance. When you entertain as much as I do you need a few recipes that are plentiful and inexpensive to make. This dip is delicious and super easy especially if you have a mini chopper, hand blender or cuisinart. PREP: blend everything thing in mini chop or hand blend until smooth. GARNISH: Fresh rosemary and drizzle of olive oil. SERVE: with toasted bread, crackers, chips or as a dip for crudite platter. NOTE: Beware of dragon breath at the end of the night, always have a bowl of mints near by! Carrots are one of my favorite vegetables. They add great colour, nutrition, crunch and are always available. Carrots are great in so many dishes you can always grate them into soups or tomato sauce for added veggies. Carrots are also filled with lots of vitamins and will help with keeping your eyes good and healthy for years to come. This carrot salad was part of my appetizer shmorgishborg at last weeks party. A great change from the same old shredded salads. PREP: throw everything in a bowl and enjoy - leave this overnight for best flavor. TIP: For slicing the carrots super thin invest in a small handheld mandolin or if you're a serious Tomato Snob go for the larger one a truffle shaver also works super well for ultra fine slices.